Is your Campus preparing students for the real world? 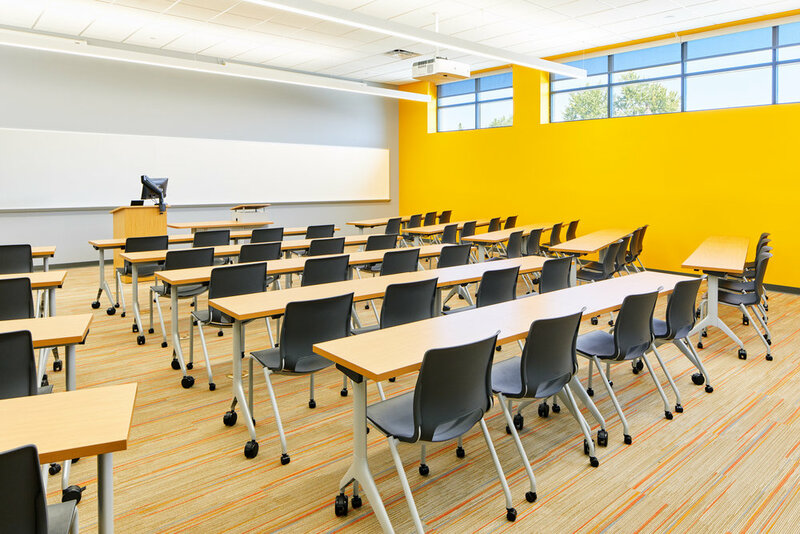 As colleges and universities adapt online learning as a larger component of their on-campus curriculum, versus a traditionally secondary component to higher education, it’s beginning to impact campus design and structure. In the past, to be competitive as an institution in higher-ed you had to be constantly expanding your physical campus, your on-campus staff and courses offered and extracurricular student experiences. Nationally renowned professors who may not want or be able to relocate to a specific campus, may be able to host online courses. Having these online courses not only increases the number of courses and professors offered, but it reduces the need for excessively large lecture halls while opening up the opportunity for more collaborative co-working style spaces. Integrating online learning into the on-campus curriculum model alleviates the needs for a large campus footprint and on-campus staff and faculty. And, according to the National Center for Education Statistics, more than 13% of students have blended schedules of traditional [in-person] and online courses. And with overall enrollment expected to rise 15% before 2025 (CP&M), thanks to many blended online learning students aged 25-35, it’s time to get the campus ready. To expand or renovate? That is the question. 52% of colleges and universities are starting, or will start, a major renovation in 2018, compared to only 26% of schools who are starting construction on new buildings (CP&M). Being a competitive college or university is no longer dependent on being the largest, it is now dependent on being the most efficient. Renovating underused campus space to expand focus on business engineering or applied learning centers that closely resembles the high-tech workplace, will provide students with real-life experiences geared toward better preparing them for the open office or work environment. It’s not about choosing to renovate or expand, it’s about choosing not to expand for the sake of it. Making sure that every faucet of your campus is functioning and serves a purpose; and only expanding when it adds value to the student experience. Modern disciplines are now mixed in an open office plan, and where corridors and staircases become transition zones for productive run-ins. Designing campus renovations to mimic co-working spaces will allow for students who are taking a blend of in person and online classes to have a place to come and work collaboratively with others in their courses, teacher’s assistants, or even professors who may not have formal offices in future campus. National Center for Educational Statistics: 2016, Enrollment in Distance Education.